Overall size: 31" x 22"
Image size: 25" x 15 1/4"
GUN 23, by Larry Selman, forever honors the heroes of "GUN 23", CW3 Matthew Ruffner and CW2 Jarett Yoder. The painting captures the final flight of CW3 Ruffner and CW2 Yoder, both killed in action on April 9th, 2013 in Nangarhar Province, Afghanistan. The painting depicts GUN 23 in their final moments providing cover for their wingman "Gun 22" piloted by CW2 John Kelley and 1LT James Kistler while circling suspected Taliban fighters. 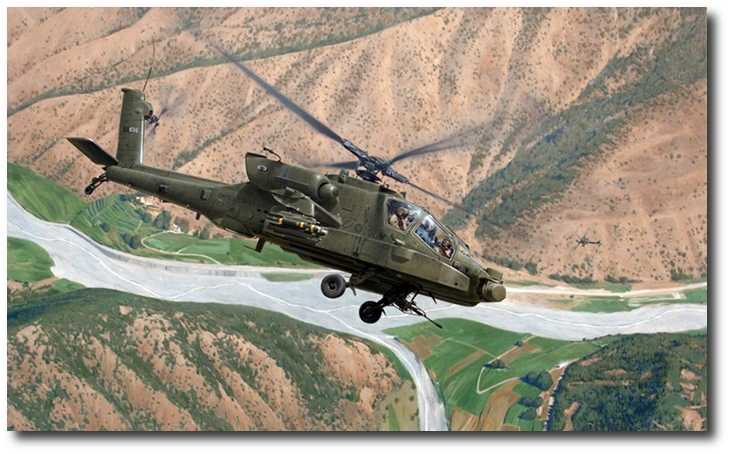 CW3 Ruffner and CW2 Yoder were assigned to B Co. "Outcast" 1-104th Attack Reconnaissance Battalion, 28th Combat Aviation Brigade, 28th Infantry Division. The 1-104th ARB was involved in direct combat actions against the enemy during Operation Enduring Freedom XIII, from December 5th, 2012-August 21st, 2013. They flew hundreds of combat missions over the most hostile regions of Afghanistan while supporting U.S. forces along with several international NATO forces in both Regional Command�s East and North. CW3 Ruffner and CW2 Yoder gave their lives defending the freedom of our nation while piloting the AH-64D Apache Longbow, the most advanced attack helicopter in the world. "Bastogne Rendezvous - Battle of the Valleys"